New research by CSIRO scientists is showing a trend for fewer tropical cyclones forming off the Western Australian coast, but those that do form may become more intense and potentially destructive. The results apply across the Australian region according to CSIRO in an interview with Dr Debbie Abbs from CSIRO Marine and Atmospheric Research. Dr Debbie Abbs said there could be a 50 percent reduction in the number of storms in the second half of this century - from 2051-2090 - compared to the period from 1971-2000. The climate model developed by Dr Abbs' team also indicates a distinct shift towards more destructive storms. "Despite a decrease in the number of tropical cyclones, there is a greater risk that a tropical cyclone that forms will be more severe in future," Dr Abbs said. "Even a small increase in cyclone intensity is concerning because of the threat to life, property, industry and agriculture," said Dr Abbs in a CSIRO media release. The research work is being done on behalf of the Indian Ocean Climate Initiative (IOCI) which is a strategic research partnership between the WA government, CSIRO and the Bureau of Meteorology. Tropical cyclone formation is a complex process which scientists are continuing to study, with global long term trends in cyclone frequency still difficult to determine from natural variability. Sea surface temperatures, wind shear, temperature and humidity of the atmosphere all contribute to cyclone formation and behaviour. It was once thought that elevated sea surface temperatures alone would increase cyclone frequency, but this has proved not to be the case. "In the early days of climate research we thought that increase in sea surface temperatures would result in more tropical cyclones. However in the world that we live in today cyclones are due to more than just high sea surface temperatures." said Dr Debbie Abbs from CSIRO Marine and Atmospheric Research. "If we get changes in either the wind shear or in the temperature and humidity characteristics of the atmosphere, then that will affect the ability of the atmosphere to form tropical cyclones, and we find that is happening, but the relative contributions are still under investigation. Some of our climate models say that it's the shear is the most important, and other climate models say it's the temperature and humidity characteristics that are the most important." said Dr Abbs. The results apply not only to western Australia but the whole Australian region according to Dr Abbs. "Our modelling shows a very consistent picture of decreases in cyclone occurrence across the Australian continent as a whole." The cyclones that do form are likely to be larger and of greater intensity, said Dr Abbs, "There's a greater likelihood, or greater risk, that the cyclones that do form will form in the category three, four and five level. To say that they'll be Cyclone Yasi is pushing it a little bit too far, but there's a greater risk that they will be at that level." The destructive potential of cyclones will increase with a change in the size of tropical cyclones according to the research, "We're finding larger cyclones, and that's cause for concern because it's the size of cyclones that affects the destruction from waves and storm surge." said Dr Abbs. Low lying Pacific Island nations are particularly vulnerable to Storm surge and extreme sea levels generated by cyclones. A December 2011 paper by Kevin Walsh, Kathleen McInnes and John McBride - Climate change impacts on tropical cyclones and extreme sea levels in the South Pacific -- A regional assessment (abstract) published in Global and Planetary Change, reviews the current understanding of the effect of tropical cyclones and climate change on extreme sea levels in the South Pacific region. "The most extreme sea levels in this region are generated by tropical cyclones. The intensity of the strongest tropical cyclones is likely to increase, but many climate models project a substantial decrease in tropical cyclone numbers in this region, which may lead to an overall decrease in the total number of intense tropical cyclones. 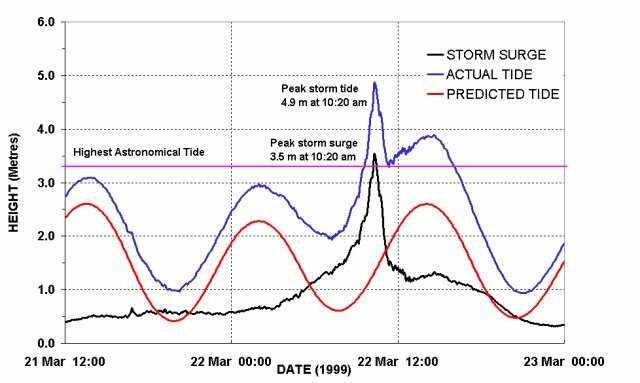 ...While storm surges from tropical cyclones give the largest sea level extremes in the parts of this region where they occur, other more frequent high sea level events can arise from swell generated by distant storms. Changes in wave climate are projected for the tropical Pacific due to anthropogenically-forced changes in atmospheric circulation. Future changes in sea level extremes will be caused by a combination of changes in mean sea level, regional sea level trends, tropical cyclone incidence and wave climate." The CSIRO and Bureau of Meteorology issued a major new report in November 2011 on Climate change in the Pacific, scientific assessment and new research in which they say that many Pacific Island nations will experience higher temperatures, sea level rise, and changing rainfall. There is also a trend for cyclones moving further south, so far by about one degree or 100 kilometres. "So that means that when they eventually peter out or decay it's going to be a little bit further south than we expect today." said Dr Abbs. Larger cyclones of greater intensity will have a major impact on human structures. Adaptation regimes need to be considered to avoid disasterous impacts such as ocurred recently with Cyclone Sendong (Washi) causing torrential rain then flash flooding in the Philippines resulting in over 1500 deaths. The Guardian has reported that the torrential rain and flash flooding circumstances were predicted in 2009 as part of a UN exercise in disaster reduction planning. The Philippines government never got around to implementing a plan to reduce this hazard. 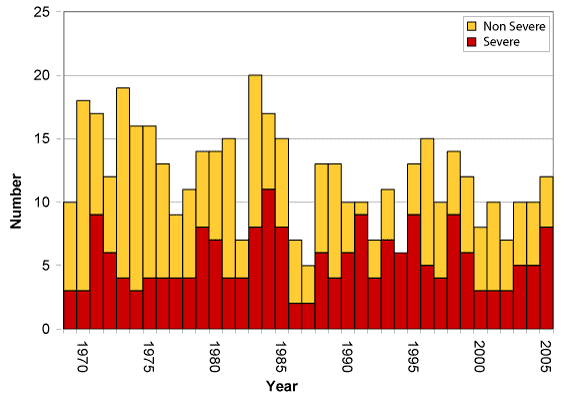 Each of the above studies finds a marked increase in the severe Category 3 - 5 storms. Some also reported a poleward extension of tropical cyclone tracks. tropical cyclones from 1970 - 2005. Copyright BOM. The work of Dr Abbs and others has been referred to The Institute of Engineers to adapt building and other civil engineering structure specifications. "The Institute of Engineers is using information related to our work to upgrade their technical specifications for wind loadings for buildings. Another part of the Institute of Engineers are revising the Australian rainfall and runoff, and that's used to design major dams, and subdivisions, gutters, and so on, drainage. They're interested in upgrading their technical specifications related to change in extreme rainfall, and for many parts of northern Australia extreme rainfall is due to tropical cyclones." The research also feeds in to State Government and Local Government planning for storm water disposal, flood mitigation and protection of buildings from storm surge in the future. The Intergovernmental Panel on Climate Change (IPCC) Special Report on Managing the Risks of Extreme Events and Disasters to Advance Climate Change Adaptation (SREX) released in November 2011 said there are still too many uncertainties for attribution of a single cyclonic event to human causation. "The uncertainties in the historical tropical cyclone records, the incomplete understanding of the physical mechanisms linking tropical cyclone metrics to climate change, and the degree of tropical cyclone variability provide only low confidence for the attribution of any detectable changes in tropical cyclone activity to anthropogenic influences." 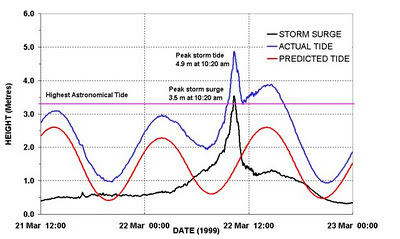 The SREX predicted for Tropical cyclones that "Intensity may increase but frequency may stay the same or even decrease. Wind speeds likely to increase, although perhaps not in all ocean basins. Medium confidence in a projected poleward shift of extra-tropical storm tracks, and a reduction in the average number of extra-tropical cyclones." "...high-resolution dynamical models consistently indicate that greenhouse warming will cause the globally averaged intensity of tropical cyclones to shift towards stronger storms, with intensity increases of 2-11% by 2100. Existing modelling studies also consistently project decreases in the globally averaged frequency of tropical cyclones, by 6-34%. Balanced against this, higher resolution modelling studies typically project substantial increases in the frequency of the most intense cyclones, and increases of the order of 20% in the precipitation rate within 100 km of the storm centre. For all cyclone parameters, projected changes for individual basins show large variations between different modelling studies." For large increases in greenhouse gases, extensive climate modeling has pointed to some consistent future changes. Future projections based on physics and using high-resolution dynamical models consistently indicate that greenhouse warming will cause the globally averaged intensity of tropical cyclones to shift towards stronger storms. The average intensity will increase with global warming. Existing modeling studies also consistently project decreases in the globally averaged frequency of tropical cyclones. In other words, there will be fewer overall storms. However that is balanced against the projected increases in the frequency of the most intense cyclones as global warming intensifies. This suggests a future world where tropical cyclones are less frequent, but those storms which do occur are more dangerous. So, the long term prognosis is fewer tropical cyclones making landfall, but the ones that do are likely to be more powerful and more destructive. Climate Adaptation measures will be important to reduce the risk to people. Disaster management planning will be important along with upgrading planning and building regulations to take account of increased wind speed, flash flooding, and extreme sea level due to storm surge associated with Category 3-5 tropical cyclones. While we may be able to reduce the risk to people, agriculture will certainly suffer from the impacts of more intense cyclones with stronger winds. Skeptical Science - What is the link between hurricanes and global warming? (2010) - includes links to several related scientific sources and summaries. Is this research Peer reviewed? If not, should we believe it?